The world has witnessed an upsurge in travel and tourisms over previous few years. Large number of people travels to various tourist destinations each year. Since frequency of travels have increased people look forward for lighter and compact luggage options such as travel bags. Travel bags are segmented under the global luggage industry, which is envisioned to witness an expansion from USD 30,969 Million in 2014 to USD 43,358 Million in 2020, registering a CAGR of 5.8%. 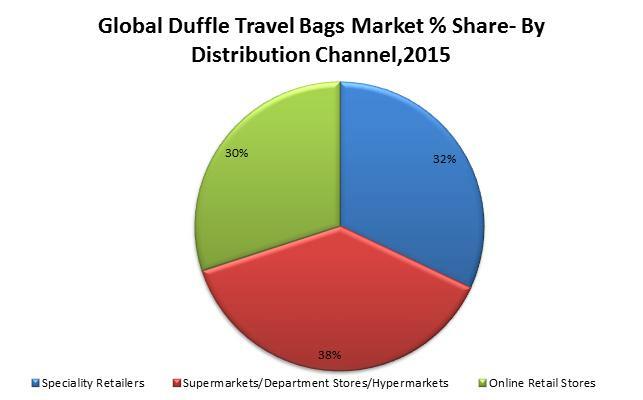 Regionally, the global travel bags market is segmented into North America, Latin America, Western and Eastern Europe, Asia-Pacific, Middle East and North Africa (MENA) and Rest of World (Row). Increasing number of passengers travels coupled with rising disposable incomes are anticipated to drive the global travel bags market in future. In addition to that, growth in urbanization is also expected to fuel the global travel bags market during 2015-2021. North America travel bags market is likely to get propelled from increasing international and domestic travels in country such as the U.S. For instance, domestic travel increased by 4.2% in the U.S. in 2014 to reach 2.3 billion person trips in 2015. Europe travel bags market is also anticipated to expand from increasing innovation by manufacturers to provide more flexible and comfortable travel bags to travellers. Asia-Pacific travel bags market is likely to witness a substantial growth during 2015-2021. The market in the region is expected to spark from increasing per capita income and rising urbanization in India and China. Global travel bags market includes some of the top players such as VIP Industries, VF Corporation, Briggs & Riley Travelware, MCM Worldwide, Samsonite, etc.